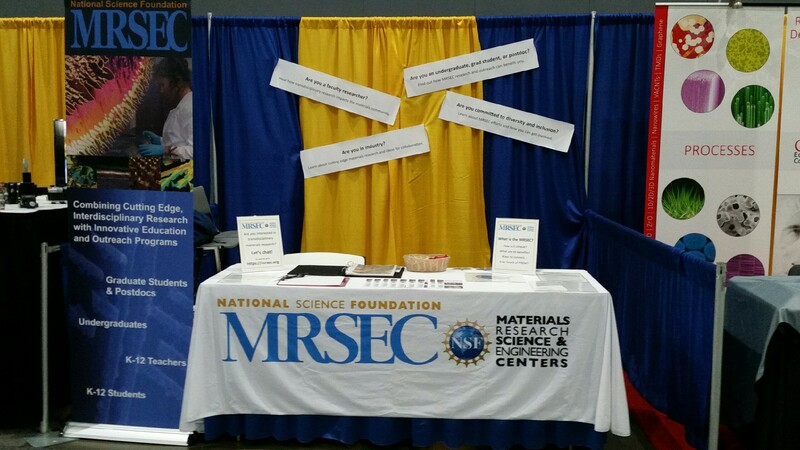 At the recent American Physical Society (APS) March meeting in Los Angeles, more than 100 attendees stopped by the NSF MRSEC booth to learn more about this interdisciplinary program. Close to 50 volunteers representing 16 of the 20 Centers helped answer questions that ranged from “What is the MRSEC?” and “What are the benefits of being involved?” to “How do students become part of the program?” and “How does the funding structure work?”. Above, (from left to right) Kristin Dreyer, staff with Penn State University talks with Luke Gockowski, currently a UCSB MRSEC graduate student and formerly a Penn State student who participated in the summer research program with PSU MRSEC REU students. UCSB MRSEC graduate student Marcela Areyano (center) and UCSB MRSEC faculty Megan Valentine talk to visitors. 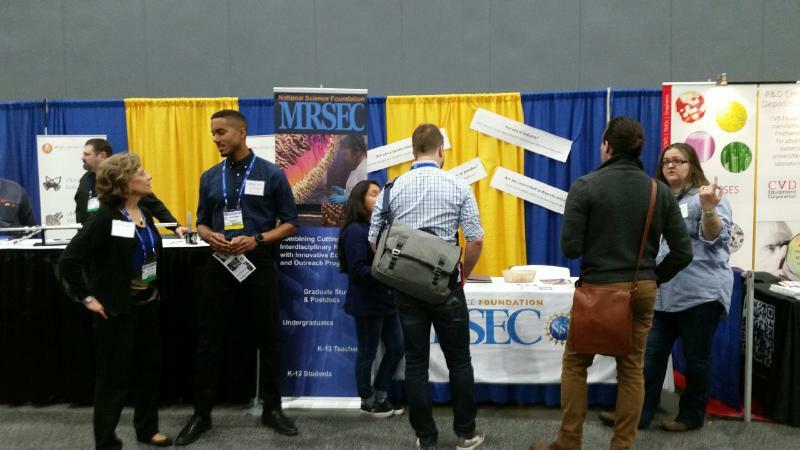 The booth (above) allowed volunteers to raise awareness and understanding of the MRSEC program and inform faculty members, students, industry representatives, and other members of the scientific community. Visibility and recognition of the MRSEC program is an important priority of the National Science Foundation. The best ambassadors and educators for this mission are current MRSEC researchers themselves.